You are currently browsing the Archaeofacts.com archives of Musings for the day Tuesday, January 27th, 2009. Unfortunately, there’s no logo or company name stamped into this pan…. 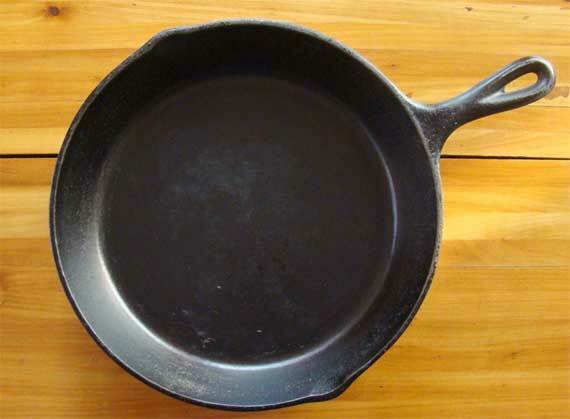 This is my favorite iron skillet. I don’t remember for sure, but I think I paid $3 for it at a yardsale. I know I bought it at a yardsale, although I don’t remember exactly what I paid, but it wasn’t much. I love how many foods cook in iron pots and pans, the qualities that the heavy iron offers, but I am leery of the rough surfaces that modern versions have. Good thing there are yardsales! Posted in personal, technology | Comments Off on Iron power!